The boat shows are coming! The boat shows are coming! Looking for a new boat? With the summer season growing a bit long in the tooth, it’s time to start thinking about those fall and winter boat shows. These not only give you a chance to look at a large number of boats all at the same time in the same place, they also present an opportunity to get a good deal. Here are three tips you can use to make that good deal even better. 1. Much like automotive dealers, this is about the time that boat dealers are looking to move out last year’s models. And quite often, there’s little variation from the 2015 Glitzcraft to the 2016 Glitzcraft. So consider buying a year-old boat, as long as it has no real hours on the meter. Note – most boat and engine manufacturers offer their warranties beginning on the date of sale, not the date of manufacture. So you don’t stand to lose anything on the warranty, either. 2. Dealers are looking to ink a deal, right then and there. Use this to your advantage, as you might time a car purchase with the end of the month (when the salesmen are really pressured to get deals done). If you’re willing to sign on the dotted line right there and then, you can usually get a “gimmie” or two, like an optional canvass boat cover, or a spare tire for the trailer. 3. Use the opportunity for comparison shopping to do just that – comparison shop. Visit several makes and models, even if in reality, your mind is more or less made up. Carry a clipboard or note pad, and take notes on each. The salesmen and dealers will notice this. If they see you walking around and gathering information, they’ll know they’re dealing with a serious buyer, who’s exploring all his or her options. And, they’ll treat you accordingly (which includes offering the lowest price they can, to keep you from heading for the competition). 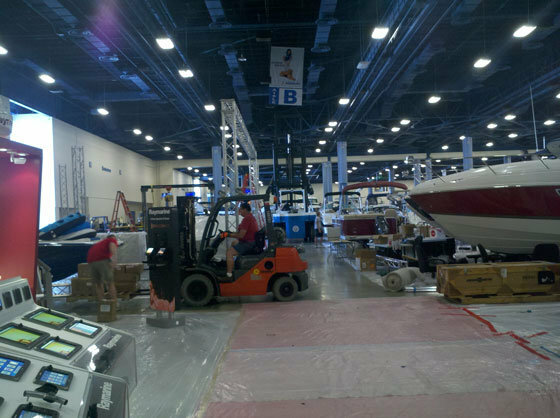 Are boat shows always the best place to make your deal? Not 100-percent of the time. You may not see exactly what you want, the boats in stock may not have all the options you need, or they may have more options than you want to pay for. But if you play your cards right, boat shows can present an opportunity that you don’t want to miss.